Hi friends, I began this project to get back to blogging, perhaps writing humour shorts again for a magazine from yet a new adventure. I thought I could put this material with many of the stories about other trips I have taken and finish off a travel book. Park on the Road, would be an appropriate name. I really had not taken a big adventure since my accident and I certainly had not written anything worthwhile so I thought perhaps it was time to get back on that horse. What I learned is when your horse dies… dismount and move on, by foot if necessary. I discovered something I am sure most of you already know and that is what you find on an adventure has little to do with discovering new things about the places you go, the people you meet or the things you see but rather what you discover about yourself. What I discovered in the end is that this will be my last adventure and probably my last series of blogs. As we travel through them I am sure you will agree what I learned was of value and it is time to put this horse down. For me this is a sad realization because I have not seen what is behind the other doors yet, but I am sure something exciting is waiting me. Let me know if you enjoy any of the stories. A friend who doesn’t want to be made famous in my blog, so I will refer to him as the Orange Runner, as in Rum Runner (someone who runs across international boarders with contraband, to be explained in a later chapter) and I packed up the old motorhome and headed out from Edmonton. The goal was to reach a ¼ Ton and LA by the end of October. That means adding 9,500 kilometers (6,000 miles) to the RV and losing 60 lbs. between us. The later seemed a pretty tall order so we changed it to ¼ tonne which means we only have to lose 10 lbs. between us a much more realistic goal. We got away late in the afternoon so we only traveled about 200 km to Wainwright where my old friend Morley told us to stop by and he would throw a bar-b-q for us. Maybe the thought of losing any weight is unrealistic. As we pulled into Wainwright he called to say he was riding his Harley from Lloydminster so would we mind picking up the stake and meet him at his beautiful hide-a-way. Unsure of what he might have to go with it we picked up potatoes, sour cream, corn on the cob and some beer. 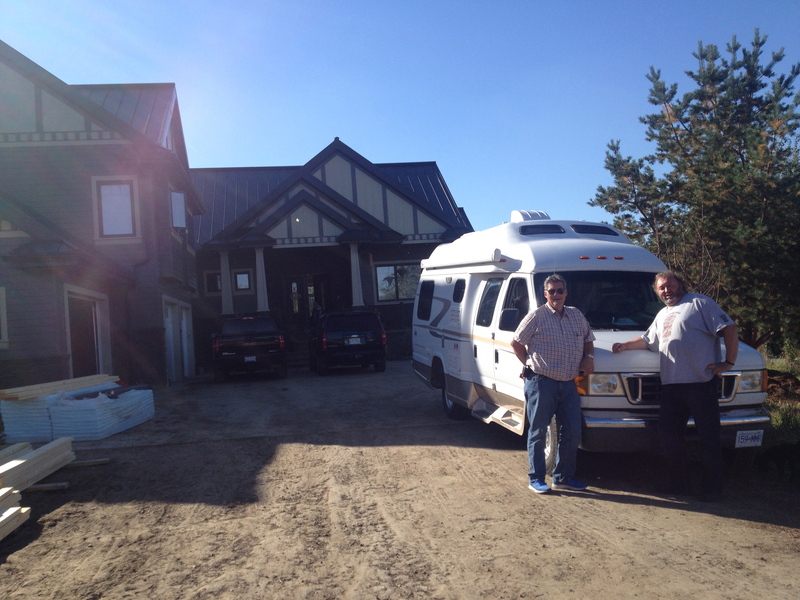 We arrived at his beautiful log home and started preparing supper when another old friend Terry Sharpe showed up with a 114 foot long motorhome and slide outs that added five more rooms to his unit. He was soon followed by Morley riding in on his bug coated bright yellow Harley. As Morley dismounted the bar-b-q ran out of propane and he said he would go get some however Terry had an extra tank in his motorhome and we continued with the potatoes and corn. Morley mixed up an incredible rub for the stakes and the meal got underway. Of course Terry had to go back to his motorhome and get some butter for the corn but Morley did have the salt and pepper so we were happy he had invited us. Of course this is not typical of Morley’s hospitality I just enjoy pointing this out as his hospitality is usually as perfect, as the meal turned out in the end. Morley’s sheds and garages provide home to an awesome collection of vehicles. The new shed included a: 1958 Apache truck, two 50 mercury’s, one a great hot rod, a 49 Mercury convertible, a 1932 International truck, A 1949 Hudson Wasp, A 38 Hudson rat rod, a1954 Buick, a 50 Ford one ton, and more, but I just didn’t remember them all. The older shop had a 1928 Indian with a 1939 engine, a Indian bike and side car, and seven Harleys, one of each engine design… sorry photos did not turn out. Morley’s Barns turned out be as good as a museum as one might find in most towns and more importantly is that each vehicle comes with it’s own unique story. Day one was ;short but complete and we had a good nights rest and were ready to begin the journey. There will be many more stories to this adventure… stay tuned. Like most other people, I’ll usually put together a list and for the immediate future and try to follow it. This year, though, I’m going to try a different approach. I will attempt to keep from being swept along by the negative commentary in the news and social media, and give others room for their views. I am going to begin with one of the biggest issues in the news today, Leadership. Next issue, I want us to all take a deep breath and look at our environment vs our economy from a purely neutral and realistic position. We have some serious concerns facing our country, but we can’t shut down all the energy companies tomorrow, so what can we do? I have some thoughts I would like you to consider, regardless of which side you are on, because we are all going to have to sit down with clear heads and hearts if we truly want to address the issue at hand. To begin with today, let’s look at Leadership, beginning with the world’s most powerful man, President Trump. I have recently read coverage from both sides of the isle and even now as Republicans seem to be lining up to throw him under the bus, I want to say I have watched many of his recorded videos and concluded that the man is just not well. Still, regardless of his mental abilities, who is to blame for his being president? Not just which party, but the whole system that allows a person to attain such a high position with poor experience in financing, no education in public office, no experience in public office and based solely on celebrity status alone. Perhaps long term, his election will be viewed as the good thing which forced American to reflect on where their system failed them, and how they can drain the swamp, or the entire slough, overflowing with career politicians. While Trump has been the source of incredible comic material, I will attempt not to follow suit in the new year. Perhaps, it is now time for both sides to put aside party differences and begin working towards a better government. This should not be a reworking of the system by the people in the system, but by a third party without profit interests in the outcome. I think it deserves some sober thought. Here in Canada, we have similar, but not as serious as problems with our government, and especially our current Prime Minister Trudeau. While I have passed along criticism and jokes about the man in the past, perhaps it is time for a sober look at where we are and what we can do in the future so as Canadians we don’t repeat the same mistake. Can, or should, we be critical of someone wanting to be Prime Minister and achieving that goal? Mr. Trudeau accomplished something many of us envy, but rather than criticize his lack of judgement or offer support for what he has done, should we not look at what he has really achieved, and how and why he became Prime Minister? We have a system in place where people vote not so much for the party but for the leader, based solely on a popularity basis. How should we choose a leader for such an important position? Choose any department under his control and ask who the senior civil servant is that serves that role and how did he quality? What education does that position require? What experience should the person have? What communication or leadership skill are required? After some consideration ask not just of the Prime Minister but the leaders of all parties, in fact of all cabinet ministers, how do they compare to the people they are in charge of? I think it is commendable that Mr. Trudeau was able to rise to this position based solely on his name, his good looks and with limited education, charm and communications skills. Reviewing the facts even his supporters would have a hard time justifying him for this position. Watching his interviews, it is obvious he is not very bright, charming or well-spoken, yet he attained his goal. He has yet to succeed at much else, other than tearing the country apart. Yet, he achieved the position through our existing process. Did he just win as a protest, against the status quo? The question is not so much how he did it, as it is who is next? Will we keep voting in leaders primarily from Quebec, where Justin says the best Prime Ministers come from, and who coincidently, have the biggest advantage because of the way politics and power is structured in this country? Will future PC’s, NDP’s or other parties put forward any better qualified candidates? The old saying is that craziness comes from doing the same thing over and over, but expecting different results. Perhaps there should be a minimum standard put forward for the office in terms of financial or political education? Should they understand the history of all parts of the country they are about to govern? Should they come from a similarly paid position so we know they are not in it for the money and have similar perks and pensions as those who service in positions under them. We need to reward the right people for the position but a $50,000 a year person should not instantly qualify for a $400,000 a year position. The position should be paid all that and more, but if the candidates could not achieve it in the real world should they be considered for it here? If we want competent people should we not pay them accordingly? I’m sorry I am sure Justin is a fine young man, but what skills, experience, education does he have for this position? I see friends posting they hate him, but do they? They don’t know him; do they just hate what he has come to represent — incompetence and arrogance? Or, is it not because of what he has achieved, but what we as a nation, or more particularly his party, gave him knowing he had the name to win a popularity contest. Just food for thought as we start our best year ever.